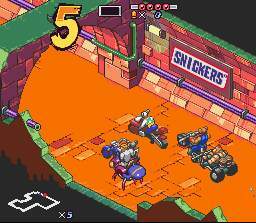 "The european version of this game obviously promotes the "Snickers" candy bar." "Manage: limited ammo and turbo. Random: random bonus awarded each lap. Only the european version is a serious game / advergame." A 3d-iso racing game starring characters from the cartoon"Biker Mice from Mars". The european version of this game is plagued with ads for the "Snickers" candy bar.